Steve Millward, Chief Analytics Officer on how the data industry has changed over the years, and where it is going. Steve Millward has been with Data Republic for over 3 years and was one of the very first people to join the company. He carries with him a legacy of knowledge acquired from over 20 years working in the Data industry, as well as a wicked sense of humour that has made him an infamous member of the team. 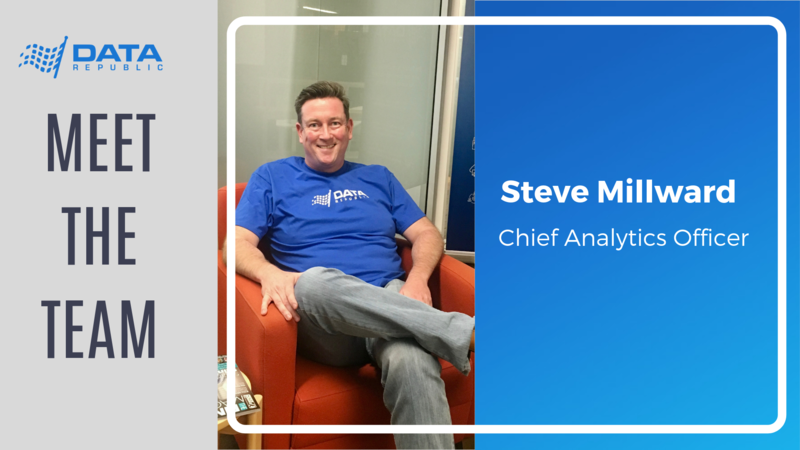 As the Chief Analytics Officer, Steve’s day to day role sees him working closely with clients, partners and team members across disciplines such as marketing, customer success, data services and technical solutions. As the third longest-standing member of Data Republic, he has had a lot of responsibility and impact on the development of the company’s processes and solutions. Having worked for companies like Experion and Westfield, Steve states that the reason he joined Data Republic came down to the innovative offer and the potential he saw in it. The change in how businesses are starting to see data, as a “raw material for decision making“ rather than a backroom function used for reporting, is something that Steve has witnessed throughout his career. Not only has Steve seen the industry change, but he has seen Data Republic grow throughout the years. He has witnessed the company transition from “a good idea to a real company with high profile investors and clients”. The culture of inventiveness, according to Steve, is fostered by his “Golden Rule” of management; treat others the way you want to be treated, and give them the authority and scope to grow. As a manager, Steve is excited by the potential of his colleagues and gives them the ability to get involved from day 1, as well as supporting them along the way. Steve’s legacy at Data Republic, also exists famously in his playing of the trombone, which was a tradition he began to celebrate company success in the early days. The balance of meaningful work, in a light and flexible environment, is something that Steve has not found elsewhere, and considers unique to Data Republic.